Here we are, at the end of our journey through out the 90s ska that made a huge impression on me as a young man. These songs are so classic! “Direction” is the first song off the first ska album I ever bought! You just can’t beat the Toasters! Potshot seemed to be all over the place back then, but I don’t remember many people talking about them. Mealticket and Inspecter 7 never really seemed to get the respect they deserved back then. I’m happy to see most people remember them quite fondly. The Slackers, one of the greats, not much more could be said about them. My Superhero are the nicest guys to eat at a Chicago Cracker Barrel with and talk about music. Let’s Go Bowling was always one of my favorites and one of the few I never got to see live. And who didn’t belt out “Teen Idol” out with their friends while driving around town from a local show the Denny’s/Perkin’s/Steak n’ Shake? I know who did though, me, Timmy Dee and Joshy Tea, you couldn’t stop us! 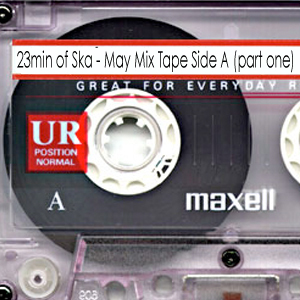 There it is, this virtual 90min 90s ska tape is up! This is the final part of a 90min ska mix tape from the nineties that ran each Thursday throughout May. This episode and all episodes can always be found at here. You can also subscribe to the podcast by going to your advanced tab on iTunes, then select “subscribe to podcast…” and entering this address: http://23minofska.podomatic.com/rss2.xml into the box that opens. Also if you’d like, find & like us on facebook. Don’t forget to download this episode and lose yourself in the past for an hour an a half, then get back to the future. Back with more straight outta the 90s! If you don’t know some of these bands, well, I feel sorry for you, because these are bands that would TEAR DOWN THE HOUSE LIVE! Ok, I haven’t seen all of these bands live, but the ones I have, I can vouch for. Secret Society rocked the back room of the Peoria Pizza Works, Stretch Armstrong stole the show from Mustard Plug and Hepcat, doctormanette snapped me out a mid show stupor in at a Rockford skate park and then made the entire crowd at the Metro in Chicago forget that they were there to see the Aquabats, and seeing Unsteady at the Knitting Factory is flat out one of my personal life high-lights. The Scofflaws are a true classic in the ska scene, so check them out right away. Also hit up Punch the Clown who was always a ska compilation ringer, and when you get an album of theirs and hear how great all the songs are it is even more clear how great they were. Speaking of ska compilations, Insatiable and this song was the shining star on the “Ska: the 3rd Wave Vol. II” that just about everyone I knew had a copy of growing up. It was a decent comp, but that song was just killer! It’s a excellent way to get us to the midway point of side B. This is part three of a 90min ska mix tape from the nineties running each Thursday throughout May. This episode and all episodes can always be found at here. You can also subscribe to the podcast by going to your advanced tab on iTunes, then select “subscribe to podcast…” and entering this address: http://23minofska.podomatic.com/rss2.xml into the box that opens. Also if you’d like, find & like us on facebook. Don’t forget to download this episode and dub it onto a blank tape and pretend it is like the olden days. Even more mid to late 90s ska excitement. Still in mix cassette form. As near as I can get in this digital age at least. This is the second half of the first side and maybe some of the names aren’t as big as were on the last one, but they run just a deep in my musical life as any of the rest. Heck, four of these bands I’ve seen live a hand full of times and they always brought the fun. Back when there was a ska show, just about every other week (where I grew up at least) bands that brought the house down live were what you wanted to go see, no questions asked, that’s what it was all about. A band just needed to get that crowd dancing, with punky excitement or steady grooves, it mattered not. If there were more people on the dance floor than standing with their arms crossed around the edges, if there were more soak through suits, dresses and t-shirts than there was dry, if there was hardly any barrier between the band and the crowd, well, you went and bought their tape or CD, you kicked in a few extra for some after show beers and you made sure to see them the next time they were near. 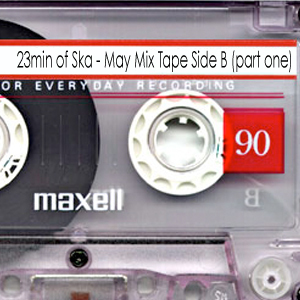 This is part two of a 90min ska mix tape from the nineties running each Thursday throughout May. This episode and all episodes can always be found here. You can also subscribe to the podcast by going to your advanced tab on iTunes, then select “subscribe to podcast…” and entering this address: http://23minofska.podomatic.com/rss2.xml into the box that opens. Also if you’d like, find & like us on facebook. Don’t forget to download this episode and blast it out of your ’89 Chevy Eurosport while on your way to a show across the state line. Getting older makes on nostalgic for their youth and instead of just wallowing in it, I’m taking you on that journey. Throughout May I’ll be providing you with a 90min mix tape divided into 4 parts each Thursday. That’s not all, this mix tape will be set in the 90’s, when mix tapes were still king. The average year will more than likely be 1996 or 1997 when we come to the end of it. This is filled with music that evokes those years more than any other and are all mix tape “classic” tracks tracks for me. I hope you enjoy this month’s ride down memory lane for me. This is the stuff that got me into ska as a kid, it is my roots, and I don’t care that they are showing. This is part one of a 90min ska mix tape from the nineties running each Thursday throughout May.